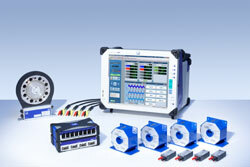 HBM Test and Measurement (HBM) complements its “HBM eDrive Testing” enhanced power analyzer with additional functions for testing six- or multiple-phase machines. This integrated solution enables torque, electrically measured quantities, temperatures, CAN[P1] bus, and other signals to be measured in an extended range of applications. "HBM eDrive Testing" is a custom measurement system for testing inverter-fed electrical machines. Unlike conventional power analyzers, “HBM eDrive Testing” provides unique and greatly accelerated data acquisition and analysis options. “HBM eDrive Testing” ensures efficiency mapping in minutes rather than days, and thus goes far beyond conventional solutions that use power meters and subsequent PC analysis. The modular measurement system can be upgraded from 3 to up to 51 power channels per mainframe at any time. It is ideal for three-phase applications and, with the latest enhancement, also for applications with multiple channels such as six-phase machines, hybrid or multiple-motor drives. In addition to its power analyzer functions, “HBM eDrive Testing” provides all the features of a cutting-edge data acquisition system (DAQ). It allows the synchronous acquisition of electrical signals as well as torque, rotational speed, temperature, CAN bus, vibration, and many other measured quantities. All data is continuously stored in real time or driven by set points.